Happy Friday and welcome to the FIFTIETH Makeup 4 the Weekend challenge!! Can you believe it?! First off, I want to say a HUGE thank you to Tangii for taking over last week and for all of you hopping along for Ginger's virtual baby shower!!! So, are you ready for this weeks challenge?? 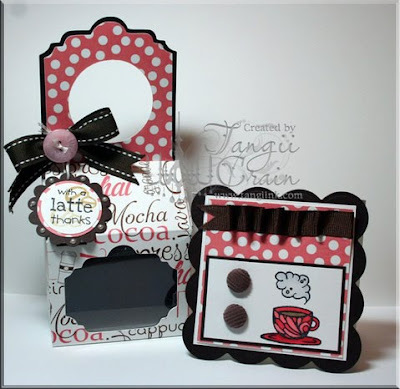 Your challenge is to use digi paper, bling, and use ribbon any way other than the typical knot or bow. Not only is that box uber-cute but its one of my favorite color combo's and *ahem* you had me at coffee girlfriend! LOL Amazing job Tangii!!! Thanks for playing along! Have a wonderful weekend and since I won't "see" you until after Thanksgiving I hope everyone has a WONDERFUL and SAFE holiday!!! !